Baby, it’s cold outside! Time to make a big pot of soup! Not only do we need something warm in our tummies, but we need as many veggies as we can get to fight all the germs around us! 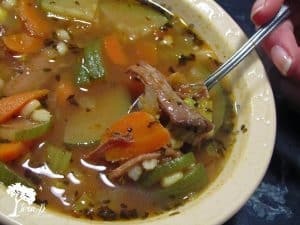 I make this hearty soup with the leftovers of the Pepperoncini Beef. You could substitute any leftover roast, or brown some ground beef, but I do think the pepperoncini meat makes it extra good! Put everything in the stockpot except the frozen corn, peas and the barley. For the ketchup, I make 2 big circles around the pot-real exact! Bring it all to a boil for 1-2 minutes, then lower temperature to a simmer for at least an hour, or more. Add frozen veggies and medium barley and simmer for another hour. 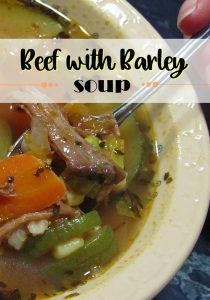 (You could speed it up by using quick barley at this point) The longer it simmers, the better your house will smell, and the more the flavors will come together. I love cornbread muffins with this soup. A little butter and honey on them…yum! I read in an old church cookbook that you can freeze garden tomatoes whole! I tried it for the first time this year, since I had 28 tomato plants :0 I rinsed and dried them, and wrapped them with cellophane and tinfoil and put them in the freezer. When I take them out, I simply run them under cold water and the skin comes right off! I chop them up while frozen and add them to my soup. Gotta love it!